Many Emails Are Neither A Success Or a Failure. | Why Be Tonto? Many Emails Are Neither A Success Or a Failure. No doubt you’ve had them in your inbox … emails that don’t stand out. They’re neither a success or a failure. But there’s one thing you can say in their favor. They’re delivered efficiently with the technology of content management systems. For many, CMS systems are often seen as the be all and end all. They’ve become the latest infatuation for some marketers. But in point of fact, they’re more the blossoms than the fruit. Especially if your emails have little power to stop people and make them read on. As you know, it takes effective writing to earn and keep an audience’s interest. With this in mind, we’ve been looking for books on how to write better emails. Most of those we’ve seen are good when it comes to technology and process. But the hope of learning to write more effective emails is a bit like waiting to board a flight when your plane is snowbound in another city. Which is why you might want to turn to something on Direct Mail writing. 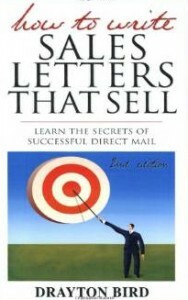 Drayton Bird’s How To Write Sales Letters That Sell can help you. This book may be focused on letters, but it’s a primer on how to communicate with interest and get people to act. It’s valuable when it comes to framing your story, marshaling your facts and presenting them in a way that sells. Small wonder, it comes from an expert who was Vice Chairman of Ogilvy Direct. Here you’ll learn how to write copy that speaks to the needs and problems of your target audience. If you’re looking to get better at lead generation, take notes on how to appeal to human emotions. You’ll also become adept at explaining the advantages of your product or service and justifying why it’s better than the alternatives. You’ll benefit with Direct Mail techniques that teach you how to retain existing customers while attracting new ones. You’ll understand how to write to people to forestall their objections to buying. Use the sample letters provided. They’re gold. Modify them to your email needs to become more effective as you leave it to your competition to invent more ways to make communications duller. Put Drayton Bird’s book to work for you. That way you can start quoting that old Dutch proverb, Blossom Are Not Fruits, to your competitors.